As scouts, we slept in tents. 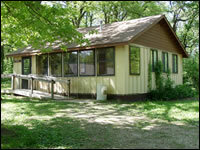 But cabins like this served as housing for camp staff, the trading post, the first aid station etc. Photo from the Scott County website. A number of people have told me that my recent post on the former Boy Scout camp near Dixon, Camp Minneyata, stirred up some memories of the scouting experiences they had there or, for women, at the Girl Scout camp, Camp Conestoga, also near Dixon. My friend Paul Bohnsack of Bettendorf called to remind me that his son, also named Paul, and I were in the same troop, Troop 53 at Wilson School in Davenport. The senior Paul Bohnsack is the president of the Walcott-based American/Schleswig-Holstein Heritage Society, a group whose worldwide newsletter I produce six times a year. But I’ve known of him since the early ‘60s because he and Joyce raised their family in the same northwest Davenport neighborhood where I grew up. Their son is three years younger than me, and in his phone call Paul reminded me that his son’s troop leaders back then where Ron Oswald and Walt Goodnight. Goodnight was my scoutmaster, as I recall, when I left the scouting program in about 1966. My scoutmaster, though, when I became a Boy Scout in about 1960 was a no-nonsense, career Army man, Arthur Piepenburg, who was a captain when he moved to Davenport and a major when he left. He always insisted that our campsites be tidier when we left them than how we’d found them on our arrival. But the first time he told his troop to “police the area” at a campsite, we didn’t have a clue what he was talking about. My cell phone doesn’t have apps (for fellow oldtimers, that’s short for applications, a program on cell phones not related to making a call). It doesn’t do email, connect with the Internet or take pictures. And it’s downright clunky to look at. But I know I can leave it in my car while I’m shopping or viewing a movie and no one will break in to steal it. Well, I guess an antique collector might want it. A friend of mine who is in his mid 70s and whose wife has Alzheimer’s and I were talking about how difficult that illness is for both those who have it and those who care for them. I told him that I suspect that one of my late grandmothers had Alzheimer’s in her final years. “But back then they called what she had senility,” I said. I am guessing that some of the men I’ve encountered who say they don’t like live theater have never really tried it. They should. Even here in the Quad-Cities, you’d be amazed at the amount of talent out there, both professional and so-called amateur. We’ve happily attended many productions in the region over the years, but we never miss a show at Playcrafters Barn Theatre in Moline or at Circa ’21 Dinner Playhouse in downtown Rock Island. When you’re not laughing at the antics of the four talented women who star in it, you’ll be singing along with them. Fall is my favorite season. By this time of the year, life has slowed a bit from summer, and we have more time to enjoy fall’s mild days and cool nights. Spring comes in second on my list of favorite seasons. It’s a time of rebirth and new life. Green grass. Leaves on trees. A time to look ahead to the rest of the year with a sense of hope. Summer ranks third for me. It’s packed with fun things to do, but many of them are outdoors and we often have to do them in brutal heat and humidity. Though beautiful at times, winter is my least favorite season. The cold, the ice and the snow seem endless by about January. While I do enjoy the change of seasons, winter could be two weeks in duration and that would be just fine with me. The week before Christmas and the week after would be long enough for winter.